Let me tell you about this beautiful spartan sword. 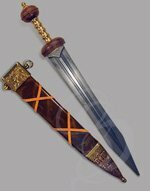 It is not the most historically accurate greek sword, but it is certainly one of the most attractive. The blade is made from EN45 high-carbon steel, with a full tang. The sharp curves and tapered forte make this sword look more like a piece of artwork (a lethal piece, at that) than a sword. We offer this sword in both tempered and non-tempered versions. The tempered sword can be sharpened making this sword fully functional. The squared brass guards point in toward one another to cradle and protect the hand that holds it. 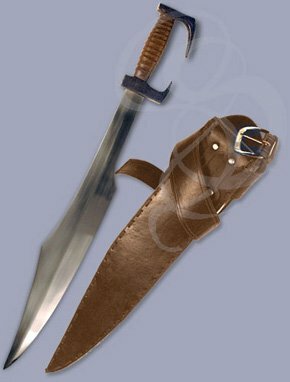 The comfortable grip is made from layered strips of high-grade brown leather, making this Spartan sword different from most others, which use a single strip of black leather. These layers of leather provide much more traction and support and are likely more historically accurate than the single-piece types. This Spartan Sword comes with a high-quality leather belt and rugged scabbard. It is extremely well built and amazingly affordable. Grab one today and prepare for the Persians! Comes with a leather belt and scabbard, and a basic care and cleaning kit. The customer service is amazing! My sword was packaged so nice. Amazing quality!! Worth every penny!!! HIGHLY RECOMMEND! Not only was the product great, but the customer service was perfect. 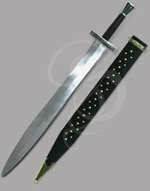 The quality of this sword was beyond my expectations for the price and the engraving was very professional. I look forward to the next time I'll need a custom sword engraved because I am definitely coming back!